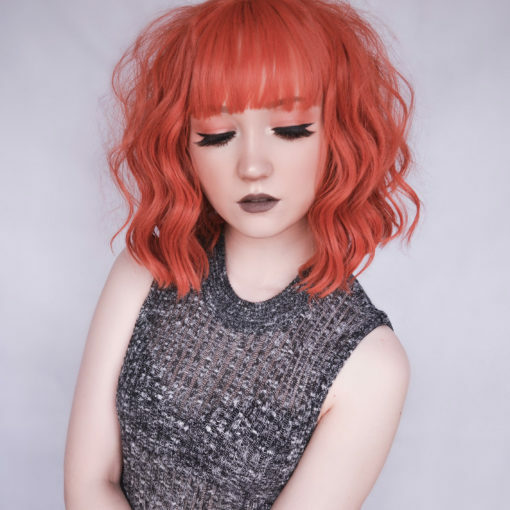 This bright orange wavy bob is a real statement wig! A blunt fringe with loose, thick waves, this one is easy to wear and maintain, and the perfect way to start your statement hair collection! This wig has a realistic skin top parting. This is my first wig from Lush Wigs and this one is soooo beautiful! The color and style are perfect, I’m in love with it. It’s also so soft and not shiny at all! Honestly it looks real. There was slight shedding but nothing too crazy. I can’t wait to buy some more!! I absolutely love this wig! The wig color is vibrant and the cut and style is exactly what I wanted. The only issue I had with this was that there seemed to be some shedding when I first got it causing the netting to be visible in the back. I was able to cover it up by pinning some of the hair or wearing hats with it, but I really wished that it arrived in better condition. Overall this wig is gorgeous, but the visible netting knocked down a star.